In 1969, Crosby, Stills & Nash tickled our imagination with lyrical exotic images of Morocco – of cobras in the square and striped djellebas we can wear – in their song Marrakesh Express. Forty years later, my friend travel writer, Tan Chung Lee adds to the pictures in our head. Photos also by Chung Lee. The image of a colourful and lively Djemaa el-Fna (pronounced Jamaa’ Elfnaa) sprang to mind the moment I heard the animated drums and singing. It couldn’t be anywhere else. I had just arrived by train in Marrakesh from Casablanca and had been dropped off by a ‘petit taxi’ at a road curb close to the square to make my way to my riad (traditional Moroccan house converted into a hotel) in the medina. What a welcome after a five-hour flight from Istanbul followed by a three-hour train ride. Soon after checking in, I hurried out again, to what must be the liveliest square in all of Morocco. There was a heady carnival atmosphere at Djemaa-el-Fna where it seemed as if an entire circus had come to town. There was a cacophony of music everywhere – from flutes, pipes, tambour, drums and even the bells of water sellers, clad in red costumes and broad-rimmed hats, hawking brass cups of water poured out of a goat-skin bag to passers-by. The loudest and most stirring music of all came from the Gnaoua spiritual music troops, beating on drums and clicking the kirkbat, which are oversized metal castanets. Spectators were huddled in groups, entranced by non-stop entertainment provided by snake charmers in one spot, story-tellers in another, dancing ‘lady-boys’ clad in women’s costumes shaking their bon-bons in a far corner and the antics of Barbary apes perched on the shoulders of their roaming owners. Berber women sitting on stools offering henna tattoos dotted the square. While the entertainers were strutting their stuff, in another part of the square, amid billowing clouds of smoke, was the waft of barbecued food coming from a jumble of stalls, selling an amazing variety of dishes – from snails and soup to deep-fried fish and kebabs. I first had a freshly squeezed orange juice, at one of the many orange and grapefruit stalls that occupy the square all day, unlike the food stalls that only roll in at dusk. Then I tried a small bowl of snails, as an appetizer, for 5 dirhams, before wandering around the square to soak in the ambience. It was quite intoxicating. What amazed me was how, every time I aimed my camera to snap a photo of some performing group, one of its members would instantly appear to ask for money. I gave a couple of dirhams each time. Later, I was told I was lucky to have escaped with such a small amount. Many tourists have, apparently, been aggressively hassled to give more, sometimes as much as 100 dirhams. Over the next couple of nights, I would go up to the rooftop terrace of Argana, one of several cafes surrounding the square, for a panoramic ringside view of the action on Djemaa el-Fna and shoot pictures without the subjects of my attention even being aware! For a true feel of the atmosphere, do eat at least once at one of its food stalls. I tried fish, freshly fried on the spot, choosing to dine at a popular stall with a long queue of people waiting for an empty table or for their takeaway orders. The fish came with a plate of grilled eggplant, mashed to a pulp – a bit like Baba Ganoush – and drizzled with olive oil, and another of mashed tomatoes, both mopped up with bread. The entire tasty meal cost only 24 dirhams (S$4.80). The action at Djemaa el-Fna does not wind down till well past midnight, when exhausted performers begin to disperse and the food vendors, with steadily diminishing supplies, start to pack up. The quickly emptying square goes into slumber till late afternoon the following day when the clamour returns. 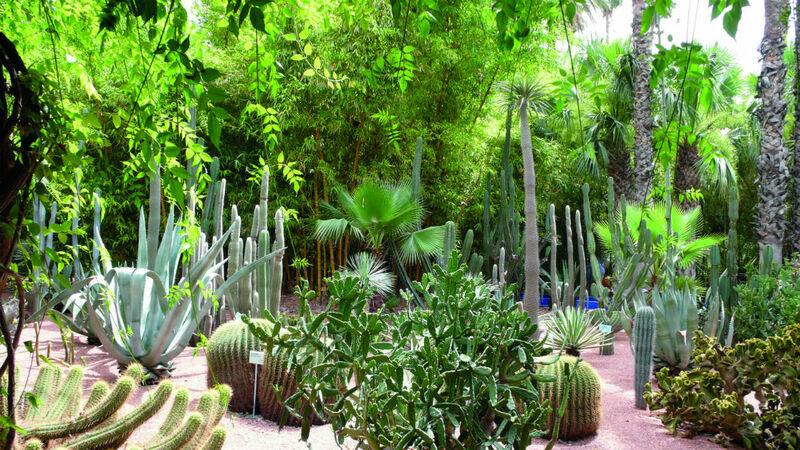 The rest of Marrakesh is just as much of a hubbub; indeed, you will spend hardly a dull moment here. Its old walled city – the medina, with its twisting alleyways – is a delight to explore. This is where you will find colourful souks (markets), selling everything from perfumes and spices to leather bags, shoes and ceramics, and beautiful courtyard homes, many of which have been converted into riads. 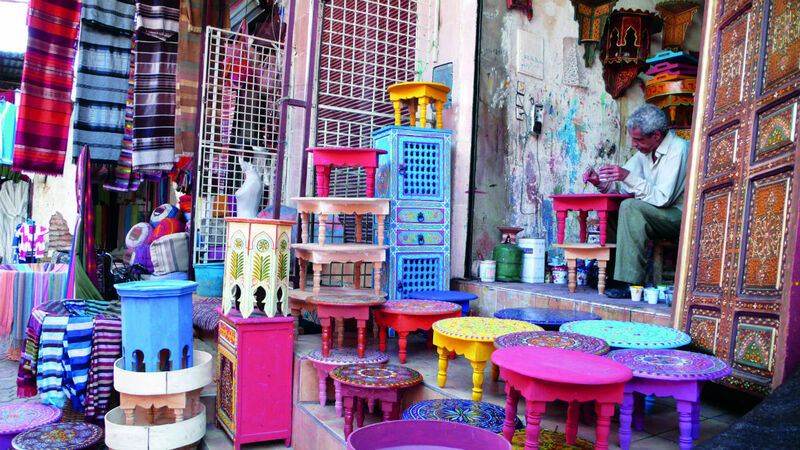 You might have to dodge donkey carts, bicycles, motorbikes and persistent shopkeepers but a wander through these souks offer a taste of the real Marrakesh, where the sights, sounds and smells of the city come alive. Tucked amid the souks and houses are some enchanting gems – hammams (old-fashioned Turkish-style baths offering spa and massage treatments; quiet gardens and the organic Earth Café, where you can buy bottles of fabulous olive oil and the prized argan oil processed from the café’s own farms. Built by the Arabs and dating back to the 9th century, the 16-sq-km medina also contains two palaces, of which the 19th century Bahia Palace is the more spectacular. In contrast, the nearby 16th century El-Badi Palace is bare; only its size alludes to a past grandeur. Close to the palaces is the former Jewish quarter, the Mellah, where you can wander in the old jewelry souk, now occupied by spice vendors, and admire the tall houses in its winding alleys. Its synagogue with a courtyard marked by the Star of David is still patronized by a small Jewish community. 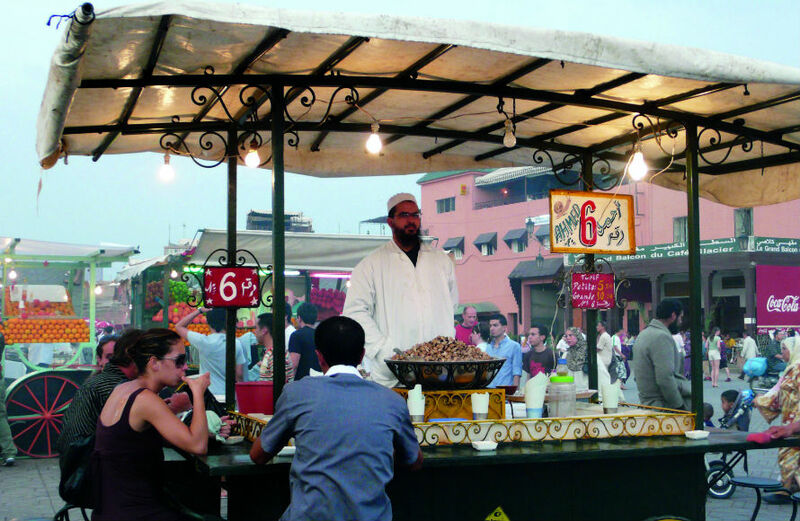 Beyond the medina lies Ville Nouvelle, the modern face of Marrakesh with its stylish shops, restaurants and bars. It was here where I was looking for an epicerie to buy some wines for my trip to the mountains that I stumbled on Majorelle Gardens, a favourite among French tourists, for the magnificent gardens created by French couturier Yves Saint Laurent and his friend, Pierre Berge, who fell in love with the city and are perhaps the first to have kicked off the Marrakesh mania among current travelers. 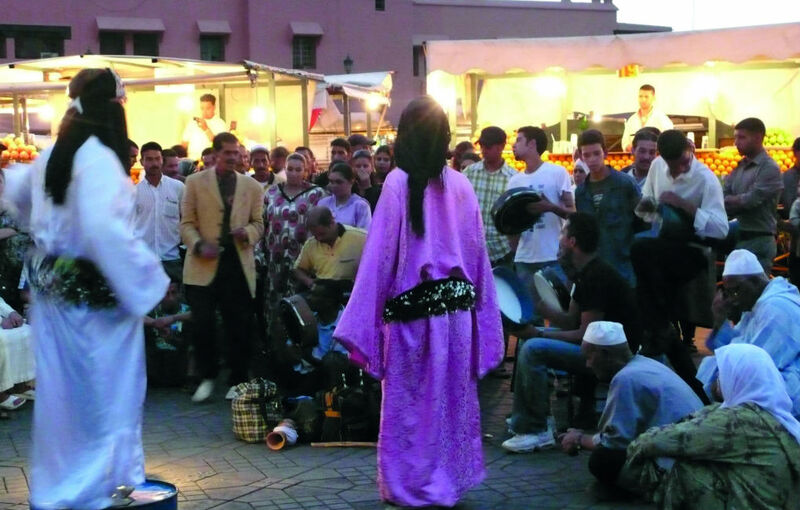 Marrakesh lies in central Morocco and there is plenty to do within this area. The variety is astonishing too – from the high Atlas mountains, just a 90-minute-drive away, and rock-cut gorges and palm oases, accessible in half a day, to the majestic red sand dunes of the Sahara at Erg Chebbi, reached at the end of a long day. Keen to do some trekking and inspired by evocative images of Jebel Toubkal, the highest mountain in North Africa, I chose to travel to Imlil, using it as a base for forays into the area. Geographically close to Marrakesh, it is a world apart with snow-capped peaks, lush valleys and hilltop villages. Apart from the breathtaking scenery, Imlil offers a glimpse of typical village farming life in Morocco, where goats are herded across pastures and fields are tended bywomen, almost all of whom are veiled and in long robes, as this is one of the most conservative parts of the country. Where are the men? I asked my guide, Mohammed, as we passed a couple of women, who had just collected a huge pile of grass each and were struggling to place it on their backs, to carry home to feed the animals. “I think they need help.” He laughed. “They work with tourists, as guides, only women work in the villages.” He gave each of them a hand and put the load on their shoulders. Summer in Morocco is hot but in the mountains, it is cool and pleasant. At night, the temperature dips even more and it was a delight to dine on the open-air terrace of my guesthouse, surrounded by views of snow-capped peaks, while the plaintive bleat of goats, herded into the third-storey pens of the local houses, after a day in the pastures, punctured the tranquility. Kasbahs have long been part of the Moroccan landscape. Some Kasbahs were the fortified homes of wealthy families while others were citadels, housing entire village populations. Virtually all of them occupy a strategic position, on hilltops, for defence purposes, and enclosed within high walls. While many of the Kasbahs have fallen into ruin because of age, some are still in quite pristine condition. On the other side of the Atlas Mountains, on the route known as the Valley of 1000 Kasbahs, I travelled in a shared ‘grand taxi’ along the tortuous but spectacular Tizi n ‘Tichka road to one of Morocco’s most picturesque Kasbahs, the iconic mud-brick Ait Benhaddou. This fortified city from the 11th century sits on a hill along the Ouarzazate River, on the old caravan route between the Sahara and Marrakesh. Like its high mountains, yawning canyons and red sand dunes, Kasbahs like Ait Benhaddou, which add a splash of colour and charm to an otherwise desolate landscape, conjure up images of romance. Little wonder, it is a favourite among Hollywood producers for use as the backdrop for epic films such as Lawrence of Arabia, Jesus of Nazareth and the most recent, The Gladiator. Home to an entire village at one time, the Kasbah is now inhabited by less than a dozen families, a few of whom resourcefully allow visitors to tour their three-storey houses and point out props used in various films in return for a small tip. End your trip in Casablanca (where I started mine). More a city of commerce, Casablanca is less atmospheric than many places in Morocco, but it has a cosmopolitan vibe and many attractive art-deco buildings. Movie buffs must visit Rick’s Café, opened in 2004, the brainchild of an American diplomat, inspired by the famous Casablanca film. The spirit of the movie is unmistakable in its interior, which faithfully captures the scenes fans will remember, although the movie was shot in Hollywood. Still, as you nurse a drink while listening to the resident pianist playing As Time Goes By, it is easy to imagine yourself in the Casablanca of the 1940s. The best way is by sharing a ‘grand taxi’ (usually a Mercedes) with five others. There is no fixed schedule unlike the buses’ you just turn up at the stand for long-distance taxis. You pay for your seat and wait for five other passengers to show up. How long you have to wait depends on the destination and the time of day. Taxis fill up more quickly in the morning and when it is headed to a popular town. To save on waiting time and more comfort, you can pay for more seats or share the cost with other passengers. There were times when I waited only 10 minutes and only once did I have to wait for two hours. Morocco’s most famous dish is the tajine, which is actually the name of the inverted funnel-shaped clay vessel used for cooking. There is lamb, chicken, beef, fish and even vegetable tajines to choose from. They are delicious, cooked with a variety of spices and over an open fire for hours. Pair a tajine with a Moroccan wine, which is of good quality. Speaking of wines, they are only served in licensed restaurants although many unlicensed ones allow you to bring your own wine, without any corkage levied. To buy wines, you should seek out an epicerie (a general grocery store) in Ville Nouvelle. I’m back from Penang where I had a good time with my girlfriends even though we split up and did different things. The problem I now have is deciding what to post because Penang is so delightful for – R&R (one friend was permanently parked on a deckchair by the beach or pool); good food (be belly smart, dress in loose clothes); and friendly locals. To start, let’s look at something small – Chinese five-spice powder. The helpful proprietor of a restaurant we dined in recommended the Pok Oy Thong brand – the best in Penang and probably the region. 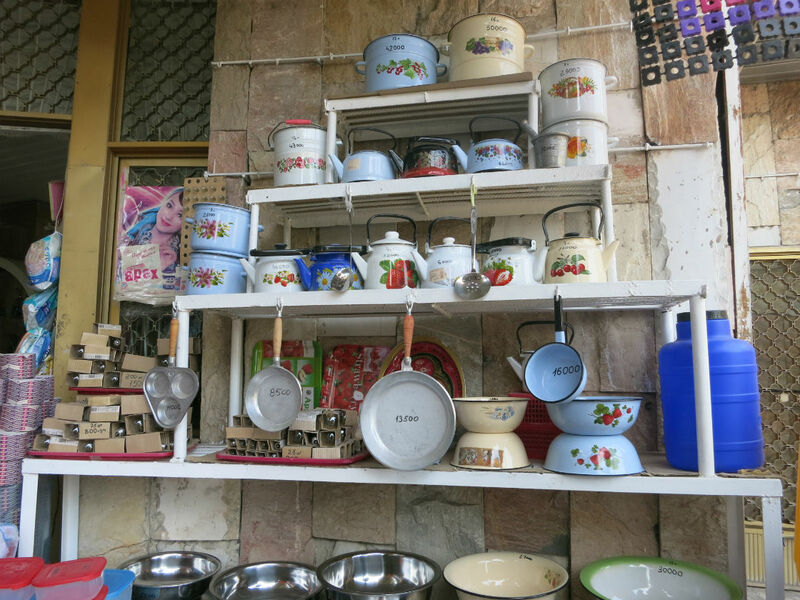 We scoured the Pulau Tikus market and checked a grocer or two. 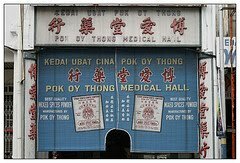 One market stallholder advised us to go to the source – an old Chinese medical hall (Kedai Ubat Cina Pok Oy Thong, 365B Lebuh Chulia). Five-spice powder varies in ingredients, but most use more than five spices. The Pok Oy Thong version contains finely ground cinnamon, aniseed, star anise, lime peel, cloves, coriander seeds, nutmeg, rice and pepper. Apparently, the number five relates to the elements – earth, water, wood, metal and fire, indicating how spices are good for the constitution. And also to the five flavours – sour, bitter, sweet, pungent, and salty – that are present in any five-spice powder. Potent and appetizing, it’s an inexpensive way to enliven everything from roasts to stews. The fragrance hit me from five shops away. Be led by your nose to the Pok Oy Thong shop and buy extra packs for friends (who will be very thankful). The price as at end October 2013 is RM4. 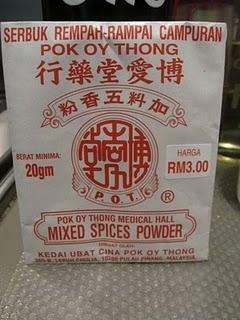 This photo from http://greenheart-ch.blogspot.sg/2010/06/penang-pok-oy-thong-5-spice-powder.html is obviously older but the packaging has not changed. The manicured man at the shop gives it a six-month shelf life, but bottled and refrigerated, it will likely keep longer. 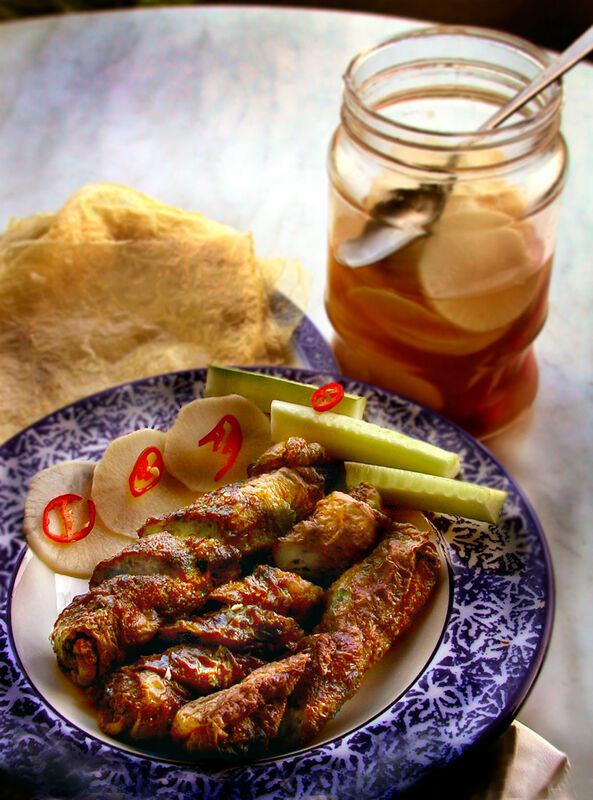 So, now you have your five-spice powder, try making one of Penang’s famous Nonya dishes – Loh Bak aka Ngoh Hiang in Singapore – meat rolls that are surefire winners as cocktail finger food or dinner side dish. Some years ago, my friend Marina’s good friend, Penangite Queenie Khoo, cooked a few dishes for us, including Loh Bak. The main difference between the Penang and Singapore five-spice meat roll is mince in the Singapore version and meat strips and egg in Penang Loh Bak. Here is Queenie’s recipe (photo by Bernard Koh). Light soya sauce, cornflour, salt, sugar, pepper, five-spice powder, coriander leaves, spring onion, egg, beancurd skin. Marinate meat in 7 tablespoons cornflour, mixed with ½ cup water, 5 teaspoons light soya sauce, pinch of salt, sugar, pepper, five-spice powder and garlic. Cover in a bowl and refrigerate overnight. When ready to fry, add water chestnuts, chopped coriander leaves, spring onion and beaten egg. Roll up in beancurd skin. Seal with cornflour mixed with water. Garnish with pickled radish and chilli sauce. Toast sesame seeds and sprinkle over Loh Bak and chilli sauce. Way off the beaten track? A challenge to reach? Dangerous even? My friend, intrepid travel writer, Tan Chung Lee will get there. Bitten by the travel bug early in life, the galloping grandma is still traversing the globe in search of adventure and to discover yet another corner of the world she hasn’t visited. Compared to Rwanda and Inner Mongolia, Malta seems tame, but like many of Chung Lee’s choice destinations, it is rich in history and scenic splendour. For an island archipelago that is small – 300 square km or less than half the size of Singapore – Malta is mighty in many other ways. It is safe, steeped in history and cultural heritage, boasts breath-taking natural beauty – on land, water and even underwater – a whole host of stunning architectural attractions, great Mediterranean cuisine focused on fresh seafood and herbs and winning wines to boot. Above all, its friendly people and leisurely pace of life all add up to make for a relaxing and rewarding holiday. Situated smack in the middle of the Mediterranean Sea, Malta has had a chequered history – all due to its strategic position which made it a prized possession for various powers. The Arabs, Phoenicians, Greeks, Romans, Knights of St John, French and British all left their mark – in the language, cuisine, architecture, cultural make up and even physical appearance of the Maltese. The result is an island with a charm all of its own. Even before the empire builders arrived, Malta was home to an ancient civilisation dating back to 3000 BC which left behind enormous Neolithic temples scattered across the archipelago, seven of which are World Heritage Sites. 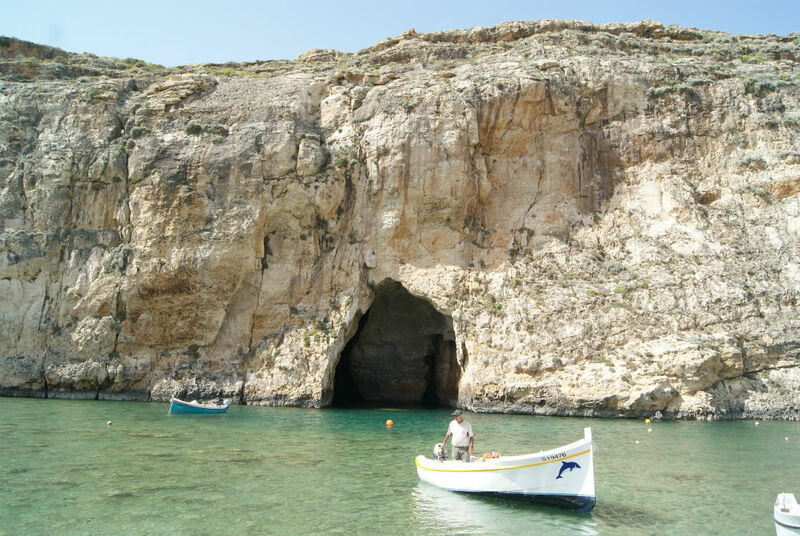 There are, in all, three islands – Malta itself, the smaller, more pristine Gozo and sandwiched between them, tiny Comino. The main island of Malta boasts spectacular architecture. 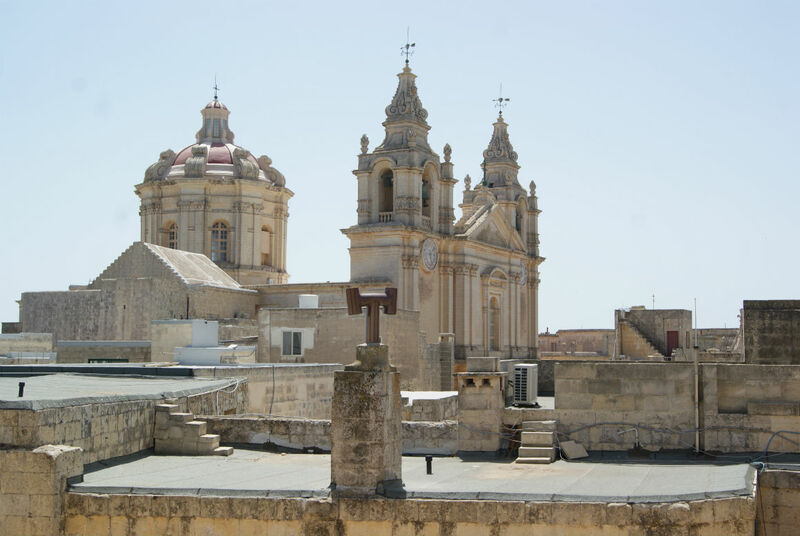 It is antiquated in every way – from its massive forts, exquisite palaces and imposing churches to sprawling gardens, watch towers and aqueducts left behind mainly by the Knights of St John of Crusader fame who ruled Malta for 250 years. Its walled capital city of Valletta and its gorgeous surroundings are best seen on a boat cruise around its appropriately named Grand Harbour or from the waterfront promenade of its neighbouring town, Sliema. A stroll through Valletta’s steep and narrow streets flanked by handsome Italianate buildings is equally delightful. 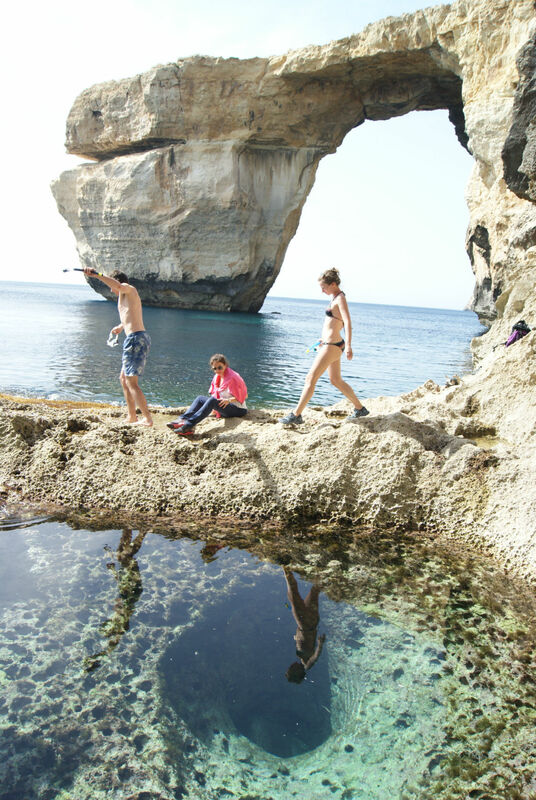 Gozo dazzles with its unspoilt natural beauty, especially along its coastline, from the Azure Window carved out of a rocky headland to its Inland Sea, a lagoon connected to the ocean through a tunnel. It’s an island that is a magnet for hikers with its many picturesque trails and it has many attractive bays offering good swimming, diving and snorkelling. The least developed island of Comino with only four inhabitants and one hotel draws hordes of day trippers lured by the crystal clear waters of its Blue Lagoon. Religion plays an important part in Maltese life. It was in Malta that the apostle St Paul was believed to have been shipwrecked in AD 60 and it was thanks to him that the islanders, then under the Romans, were converted to Christianity. And wherever you go throughout the archipelago, you will see elegant Baroque church domes dominating the skyline, creating a picture-postcard effect that will be etched in your mind long after your vacation is over. Malta is well served from most European cities, especially in summer, the peak tourist season when charter flights abound. From Singapore, the shortest routing to Malta is on Turkish Airlines via Istanbul. There is an extensive public bus network on Malta and Gozo serving most towns. Fares are cheap. Malta also has a water taxi service and frequent ferries connect Malta, Gozo and Comino. 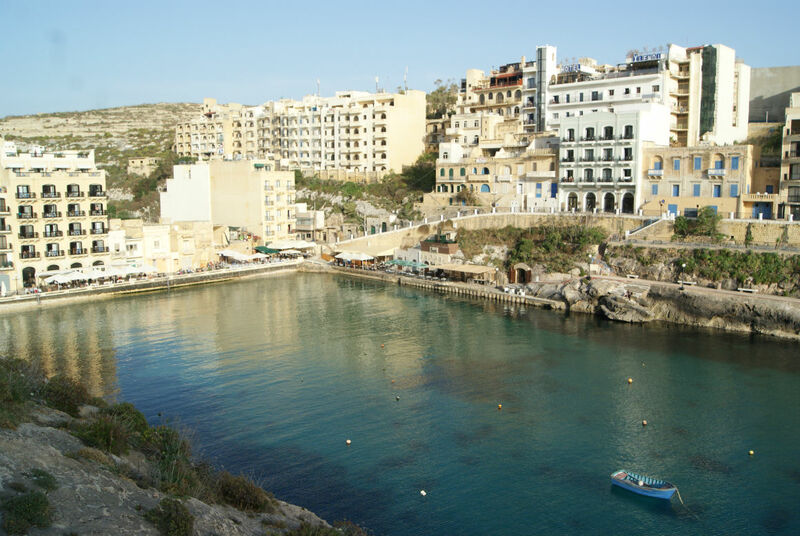 With mild winters, Malta is a year-round destination. Summer can, however, be hot and crowded with accommodation prices peaking, although it is ‘festa’ time in many towns with celebrations of their patron saint. Spring is best for hiking when the countryside is a carpet of wild flowers in bloom and the temperature is in the pleasant lower range of 20 degrees Celsius. Autumn is also a good season as water temperatures are still warm enough for swimming and snorkelling. I have friends who travel to places most of us only read about. I’ll be introducing them in my blog because for unadventurous folks like me, it’s an opportunity to go on a magic carpet ride to distant lands like Timbuktu (no kidding!). If you’re looking for somewhere off the beaten track, let my Singaporean gal-pals lead you to fabulous places they’ve visited on their own madcap getaways or for work trips. 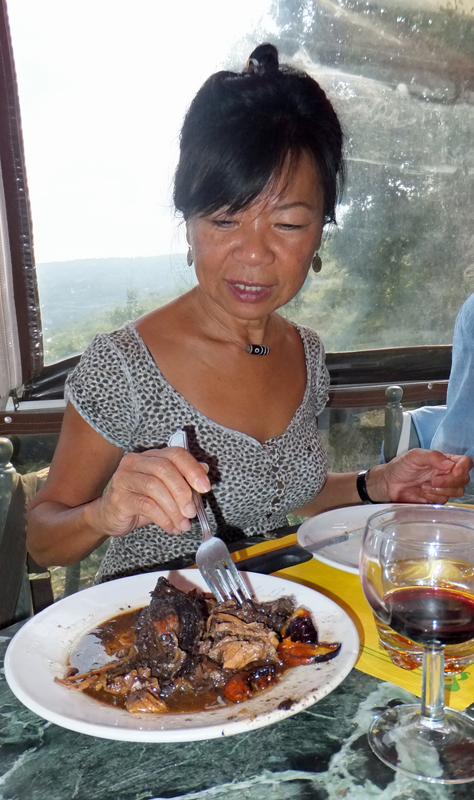 For instance, my friend, well-known chef and cookbook author, Devagi Sanmugam was in Uzbekistan a couple of months ago. Bet you’re trying to figure out where it is as Devagi was when she was invited by the World Association of Chefs, under the Train the Trainer’s program to teach Asian cuisine to chefs there. Uzbekistan is in Central Europe and South of Russia. It was formerly part of the Soviet Union. The immediate neighbouring countries are Afghanistan, Kazakhstan, Kyrgyzstan, Tajikistan and Turkmenistan. Uzbekistan was part of the Silk Road and famous personalities whom I have read about in my History lessons example Marco Polo, Genghis Khan and Alexander the Great have been here. Tashkent is the capital of Uzbekistan. Uzbekistan is a landlocked country making it difficult to access to the open sea and the surrounding countries have to access to the sea too! There are only two rivers, and quite a large part of the country is desert. Apparently, the summers are intensely hot, and winter can be as cold as -20°C. I was there at the end of autumn, and it was still hot – about 35°C. Their main industries are liquefied gas, gold, cotton, fruit,vegetables and poultry farming, and textile manufacturing. Before you get your air tickets, apply for a Visa. It is about USD65 for a 15-day visa, and it takes about 2 days to process. It is not as easy as one would think – you must go and pay for a Visa at HSBC bank, take the receipt with you to the embassy and then wait for about 10 minutes for a visa. When you enter the country, you must fill up 2 forms and declare how much in foreign currency you are bringing in. The customs will retain one of the forms, and when you are leaving the country you will have to fill up another form and hand it over along with Form 2. Basically, they need to know how much money is entering and leaving their country! You cannot change your Singapore dollars to Uzbekistan Som in Singapore or Malaysia. You will have to change Singapore dollars to US dollars and change it to Uzbekistan currency when you arrive. You get a 35-40 percent better rate if you change the currency at some “black market” shops – grocer, baker, or anyone except an authorized money changer. Anyone in Uzbekistan will tell you where the nearest black market currency exchange person is! At the time, I was there I got 1,724.52 Uzbekistan Som for SGD1!! Can you imagine how much money I had to carry around for changing SGD300?! The tour guides have many entertaining and fascinating stories. I found transport and food cheap too. The streets of Tashkent are extremely clean and green! I also found the area safe; there are always policemen around! The people are friendly and full of warm hospitality and helpful even if many of them don’t speak English. The best part of my trip to any country is a visit to the local market! I think a visit to the market can give you a glimpse of the roots of a community and their customs and the memories of places I visited are preserved. I visited the famous Chorsu (Eski Juva) Bazaar in Tashkent. I enjoyed the smell, the colours, the noises and everything in the market; it was a treat to the senses. People were selling their products on makeshift tables or wooden boxes; from vans and even on prams! Many displayed their products on the ground. This bazaar is supposed to be the oldest and biggest in not only Uzbekistan but also in the whole of Central Asia. I was told by my guide that the market was founded in the 2nd century B.C. The bazaar area has seven towering domes under which are the activities of the busy market. More than 60 over types of spices and herbs were on sale, and the smell of spices just enveloped me as I walked into the market. There was the fruit market where some of the local farmers were selling grapes, pomegranates, apples, unusually large watermelons and honey dew melons, large peaches, apricots, prunes, persimmons, yellow figs and many other fruits. I found these fruits about sixty percent cheaper than those sold in Singapore. I spent about 6 hours in the market, and it was not enough and I did not see all! I found many fascinating things to get in Tashkent. But then luckily for me my luggage was already heavy with presents from the host; therefore, I was not tempted to buy everything I fancied. Most of the souvenirs are hand made by women in the deeper parts of Uzbekistan like Samarkand and Bukhara. Making ceramics is an ancient art in Uzbekistan. I came across so many designs and shapes, and what is particularly interesting are the kosa eating bowls. These hand-made bowls look like peacock feathers. Uzbek jewellery pieces can be worn as well as used as a decorative ornament –some of it is so chunky that you can frame it up. There are very delicate wooden boxes to purchase. There are of course carpets and more carpets as well as tapestries and wall hangings. Do not forget to bring home some traditional Uzbek bread, Non. 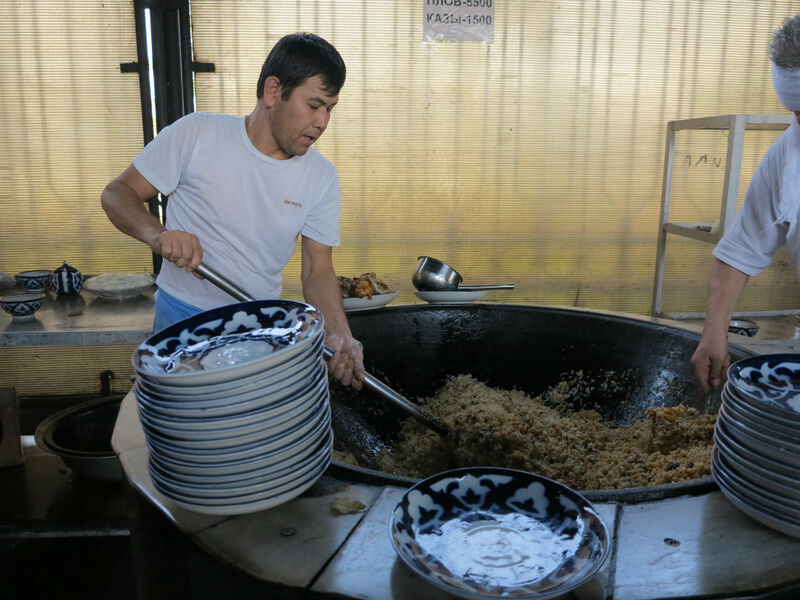 Uzbek cuisine is highly traditional, and recipes that may be hundreds of years old are still used. For example, the national dish is Plov (we call it pilau or pilaf), and it is served at weddings and any other celebrations. People still cook it with mutton fat! The rice is cooked with yellow and orange carrot, pea, quince, meat, dried apricots, pumpkin and many other vegetables. It is a tradition for men to cook the plov, and it is usually cooked in a deep cast-iron pot (kazan). Bread is relished like it is sacred. The most common bread is non, a round bread, and it is available everywhere. The breads are baked in clay ovens called thandir (it is like the Indian clay oven tandoor). The non is fluffy, light and and addictive. It’s got a glossy crust and an open, airy crumb and when it’s piping hot, it’s delicious without butter or anything. Some savoury snacks like the Samsa is actually another form of the Indian samosa; Manti is a steamed mutton or beef dumpling that resembles a Chinese steamed dumpling; Lagman is a thick soup with hand-made noodles. There are also some Korean, Indian and European restaurants. Uzbekistan is a terrific place for people to travel to. However, personally I think there should be more English speaking tour guides; more non-Uzbek cuisine restaurants and Uzbek restaurants should offer healthier food (less oil/fat and more vegetable options); perhaps offer Uzbek bread making course (I am sure everyone who visits Uzbekistan would want to learn how to make those yummy breads); create tours to fruits orchards; offer bed-and-breakfast accommodation in traditional homes.